IN CHINA'S RURAL GUIZHOU PROVINCE, Peng Bin gets the word out about the country's environmental policies using pamphlets and a Web site. But the government official has to be creative when working with some ethnic tribes. The Dong, for instance, have no written language. "They pass their history down through singing," Peng says. So he wrote environmental lyrics to traditional tunes and distributed CDs of the songs to villages throughout the region. Peng and seven other Chinese delegates dropped by the Sierra Club's headquarters this summer after completing monthlong internships with U.S. environmental organizations, including the Club. Their trip was part of an exchange program that encourages the public's burgeoning role in shaping Chinese environmental policy. Beijing attorney Xia Jun, for example, described his work on several citizen lawsuits, including one in which fishermen sued paper mills and chemical factories that were fouling waterways in Hebei Province. In a major victory, the factories were ordered in 2002 to compensate the fishermen about $1.7 million (later reduced by almost half) and curtail their discharges. Citizen activism also helped persuade the Chinese government to ban commercial logging in 140 million acres of forest. The American Bar Association, which sponsored the program with the Chinese State Environmental Protection Administration, also offers advocacy and legal training in China. This summer Alex Levinson, deputy director of the Club's Environmental Law Program, taught a seminar on mediation and arbitration in Nanjing and met with lawyers and activists in Beijing. Chinese officials are aware of the environmental cost of the nation's rapid expansion, Levinson says, but the country lacks civic, grassroots institutions. "I returned home with renewed gratitude for the established web of environmental protections and citizen enforcement laws we have here." ON THE WEB For more on the exchange program, go to abanet.org/aba-asia/projects/china.shtml. Sure, his global-warming film, An Inconvenient Truth, won an Oscar for best feature documentary, but now the former vice president has received a truly coveted prize: a Sierra Club award. This fall the Club gave Al Gore the 2007 John Muir Award, its top honor, for his decades-long efforts to raise awareness of climate change, including backing this summer's Live Earth concerts. The Club also paid tribute to journalists, politicians, and youth activists at its annual banquet September 29 in San Francisco. New York Times columnist Thomas Friedman, who helped escalate the national discussion of global warming, won the David R. Brower Award for his writing on the environment and U.S. energy policy. California State Assembly speaker Fabian Núñez (D) received the Distinguished Achievement Award for coauthoring his state's precedent-setting global-warming bill. And Tyler Dawson, a Sierra Student Coalition organizer in Ohio, took home the Joseph Barbosa Earth Fund Award for his campus campaign on clean energy. The other recipients were Wilbur Mills (Ansel Adams Award for conservation photography); Argentina's Center for Human Rights and Environment (EarthCare Award for international work); Representative Mike Thompson (D-Calif.) (Edgar Wayburn Award for outstanding service by a government official); Lacinda Athen (Electronic Communications Award for solveglobalwarmingwisconsin.org and other Web sites); Rochelle Becker and Leslie March (Environmental Alliance Award); the Sierra Nevada Group (Denny and Ida Wilcher Award for membership development and fundraising); Larry Volpe (Madelyn Pyeatt Award for working with youths); the Cumberland Chapter's Cumberland (Newsletter Award); Don DeFremery (Oliver Kehrlein Award for service to Sierra Club Outings); Paul Carlton (One-Club Award for combining conservation and outings); Harriet Sayuri Iwamoto, Susan Reski, and the Illinois Chapter (Special Achievement Award); G. Anna Holden, Wallace McMullen, and Lynne Plambeck (Special Service Award); Dean Amel (Susan E. Miller Award for contributions to Club chapters); Jan O'Connell (William E. Colby Award for administration); Theodore A. Snyder Jr. (Walter A. Starr Award for continuing work by a former Club director); and Richard Duncan (William O. Douglas Award for outstanding use of the legal process). ON THE WEB Read more on the winners, or nominate candidates for next year, at sierraclub.org/awards. The deadline for nominations is June 1, 2008. With nearly 95 percent of California's San Joaquin River diverted for irrigation, residents of Stockton, situated on the river's delta, take an active interest in how their water is managed. 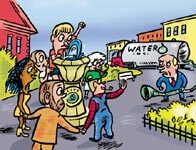 After battling for four years to regain public control of the city's water, local environmentalists cheered when the Stockton City Council voted this summer to terminate the contract that had privatized its water system. Newer isn't necessarily better when it comes to dirty energy sources. In coal-rich Muhlenberg County, Kentucky, Peabody Energy has proposed building a 1,500-megawatt power plant that would rely on locally mined coal (rather than cleaner low-sulfur alternatives) and lack the latest pollution controls, emitting about 12 million tons of carbon dioxide annually. But thanks to the efforts of the Sierra Club and Indiana-based Valley Watch, plans for the Thoroughbred facility have been reined in. The Club, Valley Watch, and a few citizens sued to block the plant's air permit, and in August a Kentucky circuit court judge agreed, saying the facility would not only endanger human health but could stifle industrial growth in the area for decades to come. "This shows that even in the heart of coal country, people are beginning to recognize the problems it causes," says Sierra Club attorney Sanjay Narayan. At press time, state environmental officials had appealed the decision. Read more about the Club's efforts to fight the nation's "coal rush" at sierraclub.org/environmentallaw/coal. —H.M. CONTACT US Spotlight your Sierra Club chapter's activism by e-mailing karina.kinik@sierraclub.org or writing to Karina Kinik at Sierra, 85 Second St., 2nd Floor, San Francisco, CA 94105. Join the Sierra Club's Take Action Network at sierraclub.org/takeaction, where you can send e-mails and faxes to your elected officials. 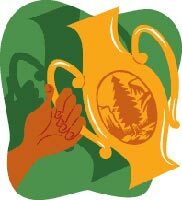 For the latest on Club campaigns, go to sierraclub.org/email, where you can sign up for our biweekly e-newsletter, the Sierra Club Insider, and other Club e-mail communications. Illustrations, from top: Debbie Drechsler, Lloyd Dangle; used with permission.